It’s a scientific fact that Zak can’t jump that high. But look at Roxy! 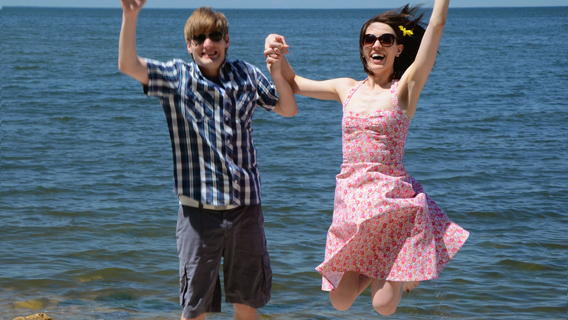 June 21 marks the first official day of summer, and all of us over at WhooNEW are so excited, we’re jumping for joy. Literally. Summer can traditionally take a long time to arrive in Wisconsin, and this year was no exception. After all the snow and rain (and more snow and rain), I’m starting to consider June 21 my mid-year Christmas. (Don’t expect any gifts, Zak Bruss. But I’ll take some if you’re feeling generous.) It’s exciting, people. We’re finally approaching the heralded start of nice weather, fresh produce from the garden, days on the beach, and summer vacations. So what are you going to do to mark this momentous occasion? We’ve rounded up a list of seven ways you can start your summer off right. Whether you’re located in Green Bay, the Fox Valley, Oshkosh, or Door County, this list has something for you. If you’re a bit of a foodie, your event of choice will be Savour Green Bay. This food lovers’ festival will feature an eclectic mix of local food, alongside live music, craft beer and select wine. Admission to the event is free, so you can wander around taking in the great aromas as much as you desire. Actually partaking will cost you more, but we’re sure it will be worth it. Savour will also feature cooking demonstrations from local chefs. The restaurant partners include gems like Three Three Five, Mustard Seed Cafe, and Republic Chop House. My mouth is watering already. Savour runs from 4 pm to 10 pm Friday, June 21, and from 11 am to 9 pm Saturday, June 22. If you’re more interested in working off calories rather than consuming them, your activity of choice may be the Riverfront Community Bike Ride in Appleton this Friday. The ride will be a very do-able 6 miles, and is held at a reasonable enough pace (10 mph) that those of us who do not own biking bodysuits can join in the fun. People of all ages and abilities are welcome, and you don’t have to pay to ride. You can find the route here. And apparently, if you attend, you’ll be clued in to some exciting developments for Light Up the Fox, a project that celebrates the history of the Fox River with riverfront light displays and celebrations. I, for one, am excited to see what they come up with. The ride will last from 6:30 pm to 8:30 pm. I’m sure some of you are parents, and now that school’s been out for a week or so, you might have already started that hair-pulling part of your summer. So if you need to take your kids somewhere to run off some energy, or a way to escape from the repetition of “I’m bored,” head over to the Kickoff to Summer celebration in Sturgeon Bay. The event goes from from 10 am to 2 pm, and will feature a petting zoo, bounce houses, a kickball tournament, free rentals of sporting equipment, and more. You’re sure to at least get a few minutes of peace and quiet. And no worries if you’re on a budget — admission is free. If you love a good deal and all things vintage, you’re my kind of people. Also, go to Everybody’s Rummage Sale at Shopko Hall this weekend. Seriously, this sounds like my paradise. You get all of the benefits of an afternoon of rummaging, and you don’t have to hop in and out of your car every two seconds (or worry about how your hair is looking in the wind. No, of course I don’t do that. What kind of a girl do you think I am?). There will be over two hundred vendors offering all kinds of wares, from baby stuff to books to electronics to jewelry to pretty much anything else you can imagine. Admission is just $2.00 per person, and kids twelve and under are free. You can also score free parking at Lambeau Field. If your ideal day involves a frosty pint and some live music, Brews n’ Blues is the place for you. At Oshkosh’s 18th annual microbrew and music festival, you’ll have a chance to sample some of finest beer in the region. Tickets are not what you’d call cheap ($35 in advance, $45 at the door), but remember that this is basically an “all the beer you can drink pass.” And as my husband likes to remind me when I complain about the price of a six-pack, this is not Miller Lite you’re drinking. The quality alone is worth it. And Brews n’ Blues will most definitely deliver in that category; they have 30 brewers on hand, and over 100 brews to be sampled. (Challenge: Can you drink 100 beer samples and still stand at the end of the night?) You can find the extensive list here. The event runs from 4 pm to 8 pm, and raises money for local charities. Hey, I’ll drink to that. Looking for a cultured way to spend your weekend? Head to Art on the Town, Appleton’s downtown art extravaganza. This free event takes place monthly during the summer, and features every sort of art: performing, visual, musical, and culinary. Many of the galleries and shops along College Avenue will stay open, so you can stop in and see some artist demonstrations and displays. You can find a list of the participating venues here. Art on the Town features a different theme every month. This time around, it’s Fiber Rain, so you’ll find fiber art displayed throughout downtown Appleton for your enjoyment. Art on the Town runs from 6 pm to 9 pm; you can park for free at the Edison Center off Olde Oneida Street. June 21 isn’t just the first day of summer; it’s also the longest day of the year, or the summer solstice. If you’d like to head outdoors to celebrate the fact that it no longer gets dark at 5 pm every night (something we’re all very grateful for), check out some of the summer solstice events held at state parks throughout Wisconsin. If you have kids with keen instincts, try the Solstice Scavenger Hunt at Peninsula State Park in Fish Creek on June 21. You can stop by any time between 10 am and 1 pm to complete the challenge. If you’re more of a night owl, head over to High Cliff State Park in Sherwood for a late night hike — without a flashlight. The Friday night hike takes advantage of the longest day of the year by starting at 9 pm and hiking til about 10 pm. If plants are more your style, check out the Fern Trail Solstice Hike at Newport State Park in Ellison Bay. Naturalist Joan Wilkie will take you for a one and half hour hike and describe how important these long days of the year are for ferns and wildflowers. That hike is on June 22 at 10 am. And last but certainly not least, insect lovers will need to head to the Moth on the Moon Night Walk at Potawatomi State Park in Sturgeon Bay. You’ll get the chance to stroll along a moonlit trail set up with stations to lure a wide variety of moths and other nighttime insects. I’m sure it won’t be as creepy and crawly as it sounds. This event takes place on June 22 from 8:15 to 8:50. So what did we miss? How are you planning to start your summer? Let us know in the comments!